WASHINGTON, Feb 19 2014 (IPS) - An estimated 400 million acres of farmland in the United States will likely change hands over the coming two decades as older farmers retire, even as new evidence indicates this land is being strongly pursued by private equity investors. Article is timely and makes key points. Add to this the handout of taxpayer money our Congress just gave to big Ag, especially when (as I understand) they did not take away the most corrupt element, that multiple ‘owners’ can claim subsidies on the same farm. Instead of having the subsidy go to the farm and making the owners share it. Add to that the obscene struture of the crop insurance, at different levels, which will be looting the taxpayers when the crops fail, as they will do in future with climate change (and are already doing). The taxpayers are guaranteeing them a high income and total insurance at all levels. Nobody else gets that kind of security, especially when you are getting your house foreclosed, and are long-term out of a job. Many of the crops are grown for export, and not to feed us. I have read many stories from small farmers about how the new farm bill favours big outfits, and does not work for their needs. I am told that Chinese investors are buying up land at an unforeseen rate ! One example is in Florida where hundreds of thousands of acres are being purchased by Chinese investors. At this rate , we will be the tenants of foreign concerns. The formation of modern day corporate Latifundia’s continues apace. just as the US becomes energy independent, we become food dependent. 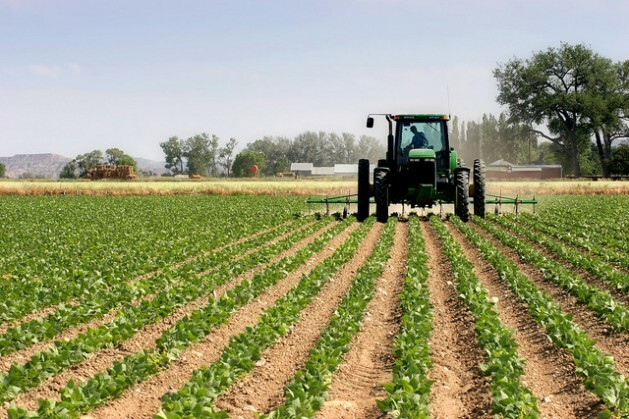 it takes about 2.5 million to start farming from scratch. i know, i did it. the usad budget isn’t about promoting conservation or new farmers anymore, it’s about free food to people who don’t or can’t work. Congress, Asleep at the Wheel, as usual. P.S. – as to crop insurance: it does not provide either a guaranteed or high income to farmers. it just gives a teaser to provide some hope of recouping input in case of failure. the USDA “farmed out” the administration of crop insurance about 20 years ago to private insurance companies (about 10-12) who are the ones getting rich AND under the contract with the USDA, their losses are capped. Great American, for one. This is the real sweet deal most folks, incorrectly, think the farmers are getting. If I raise poor crops for a few years, my average bushels per acre go down to the point crop insurance pays about zero. Farmers are also subject to poor prices in part due to the interference with free markets by the US Government (State Department). Try to sell commodities to Cuba, for example. But yes, we do live in a capitalist society and John Deere and Monsanto can market freely on a global basis. I Think they are to late or buying at these prices is nuts. same farm that I bought for $2001.00 Per acre in 2000 and now I was offered $10000.00 this year ( corn $8.01 last year now 4.45) I am betting it will go down $8000.00 next year it is paid for so I take my % . So I will set on cash and wait. don’t get in a hurry ! Around the globe, revolutions have always followed consolidating landholdings and agriculture into the hands of the few whether by private interests or government holdings. Think corporations, royalty and the wealthy, communist holdings, etc. The variety of consolidators is amazing. The result the same.